A book of poems, scripted and ready to perform, for the elementary grades! Complete with Director’s Notes and Teaching Ideas. 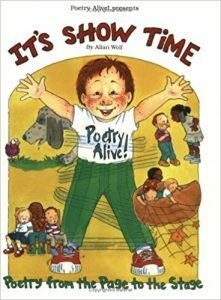 Includes poems by Ogden Nash, Christina Rossetti, Vachel Lindsay, Robert Frost, Gwendolyn Brooks, James Whitcomb Riley, and more. Available from Poetry Alive! or by calling (800) 476-8172. 2019 © Allan Wolf, Inc.